Leaving cloven hoofprints from the Yukon-Kuskokwim Delta to the Arctic National Wildlife Refuge, more than 3,500 musk oxen live in Alaska. All of those shaggy, curly-horned beasts came from one group of musk oxen that survived a most remarkable journey in the 1930s. In 1900, no musk oxen existed in Alaska. Though the stocky, weatherproof creatures have survived in the Arctic since the last ice age, the last reports of native musk oxen in Alaska came from the late 1800s. As Peter Lent reported in his book "Muskoxen and Their Hunters: A History," Henry Rapelle in 1895 visited a Native man living on the bank of the Yukon River who had the skull of a musk ox. 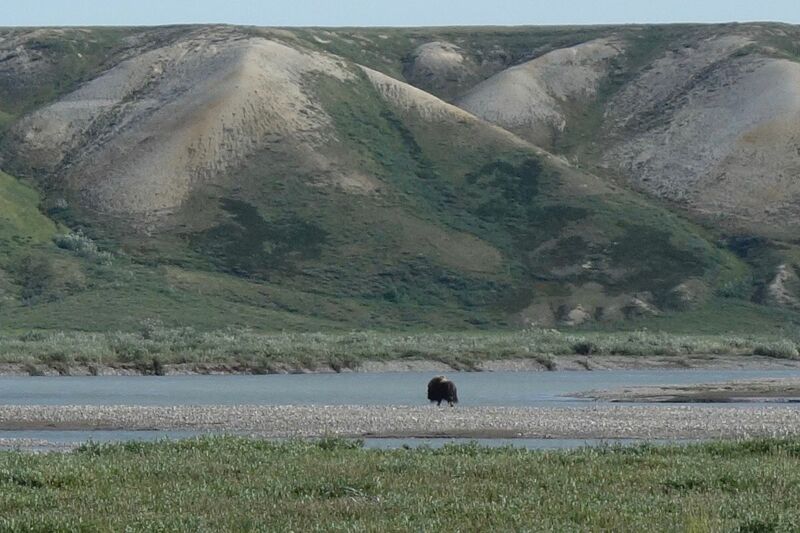 He told Rapelle he thought the musk ox was "a bear with horns" when he shot it a year earlier on the Kandik River. That musk ox was perhaps the last of the Alaska population. In May of 1930, members of the U.S. Congress gave U.S. Biological Survey scientists $40,000 "to acquire a herd of musk oxen for introduction into Alaska with a view to their domestication and utilization in the Territory." And there began an 8,000-mile adventure, the moving of 34 musk oxen from Greenland to the Alaska island of Nunivak. The journey — by boat, train and barge — lasted six months, including one month the musk oxen spent in New Jersey. In summer, 1930, Norwegian sailors captured 19 female and 15 male musk oxen from Greenland. The leader of the expedition kept a journal of the captures, during which his men shot adult bulls in order to rope calves and yearlings without being crushed. "There is much violence in a flock of musk oxen," he wrote. By the end of August 1930, the sailors moved all the animals to Norway. From there, handlers loaded them in crates on a steamship. The wooly caravan crossed the Atlantic and passed beneath the Statue of Liberty in New York on September 15, 1930. The musk oxen were soon in Athenia, New Jersey, to wait out 33 days of quarantine. In the heat of 60 degrees Fahrenheit, the musk oxen panted heavily, drank plenty of water, and lapped at salt licks attendants placed in their crates. All 34 musk oxen survived the quarantine. After crossing the continent by train from New Jersey to Seattle, the musk oxen took a seven-day voyage on a steamship to Seward, Alaska. To make the lower deck cooler for the musk oxen, the captain opened the hatches of the ship. From Seward, Alaska Railroad cars transported the musk oxen to Fairbanks in four days. On Nov. 5, 1930, all 34 arrived in good shape at the Alaska Agricultural College and School of Mines (now the University of Alaska). University workers released the musk oxen from the crates, and the beasts roamed a 40-acre clearing surrounded by boreal forest. A few calves were born in Fairbanks, but the musk oxen-rearing experiment proved expensive, in part because of the cost of fencing, both to keep the musk oxen in and to keep black bears out. The leader of the experiment, L.J. Palmer, decided to move the musk oxen from Fairbanks to Nunivak Island, a 70-by-40 mile oasis of tundra in the Bering Sea just off the Yukon and Kuskokwim Delta. Charles Rouse was a biologist who accompanied 27 crated musk oxen to Nenana, where he and others loaded the musk oxen on a steamship. The load of ice-age mammals chugged down the Tanana and Yukon rivers to Marshall, Alaska. There, workers loaded the musk oxen onto a barge, which transported the musk oxen to St. Michael, at the mouth of the Yukon. Then, it got hairy. The musk oxen and Rouse crossed 300 miles of open ocean in an aged barge towed by the Meteor, a motor boat. Midway through the trip, "the barge began to reveal its age," Rouse wrote. Waves battering the bow opened a seam in the barge through which water began to pour. Rouse and four others used hand pumps to keep the barge from sinking until the Meteor made it to Nunivak Island. The musk oxen thrived in Nunivak. From the population of 31 planted there from Fairbanks in 1935 and 1936, the Nunivak herd expanded to its present size of more than 600 animals. From that stock, biologists transplanted musk oxen to the mainland east of Nunivak Island in 1967 and 1968 (23 animals), to the Arctic National Wildlife Refuge in 1969 and 1970 (64 animals), to the Seward Peninsula (72 animals in 1970 and 1981), and northwest Alaska (70 animals in 1970 and 1977). Musk oxen have flourished at each site, showing the same pluck that allowed them to survive their incredible journey to Alaska in 1930. Since the late 1970s, the University of Alaska Fairbanks' Geophysical Institute has provided this column free in cooperation with the UAF research community. Ned Rozell ned.rozell@alaska.edu is a science writer for the Geophysical Institute. A version of this column ran way back in 2001.